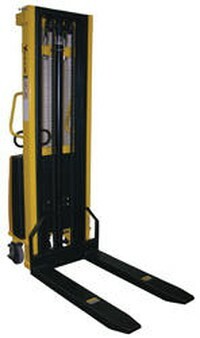 Semi-Electric Stackers with Powered Lift will raise and lower loads quickly and easily. 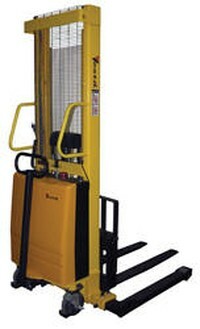 Manual push operation stackers are made using high quality material and parts. All models are easily maneuverable using the standard pulling handle. 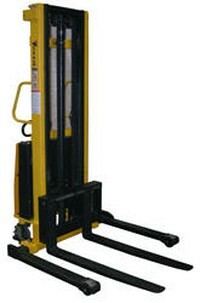 Stackers are highly efficient and durable. 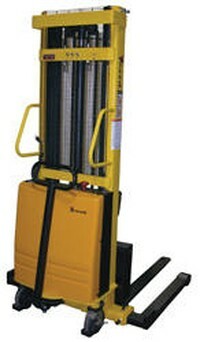 Semi-electric stackers use (1) 12V, 130-140Ah battery. Integral battery charger and battery level gauge. Overall fork size is 26-3/4"W x 42"L. Lowered height is 3-3/8". Stainless Steel Semi-Electric Stacker with Powered Lift, model V-SL-80-FF-SS, will raise and lower loads quickly and easily. 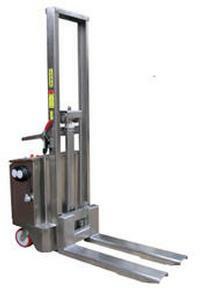 Manual push stacker is constructed of high quality 304 stainless steel. Suitable for most food, medical, pharmaceutical industry, and wash-down applications. Features one (1) 12V, 130-140Ah battery, on-board battery charger, and battery charge indicator. Unit maneuvers easily on two (2) swivel and four (4) nylon load rollers. Optional 24V traction drive system available. Traction drive is factory installed only. Please call ZORIN (888) 378-6525 for pricing. 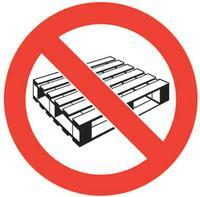 Note: Fixed Forks Over Fixed Support Legs can not be used on standard pallets - they are for totes or skids without the bottom boards.